Creation of a unified, multi-party government in Congo, with Joseph Kabila as president and Jean-Pierre Bemba as prime minister. 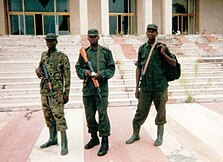 Pretoria Accord; Rwandan withdrawal from Congo in exchange for commitment towards the disarmament of Hutu militias. The Transitional Government of the Democratic Republic of the Congo is established, deployment of MONUC. Continuation of the Ituri conflict. Start of the Kivu conflict. Note: Rwanda and Uganda fought a short war in June 2000 over Congolese territory. ↑ "Africa's great war". The Economist. 4 July 2002. ↑ Coghlan B (January 2006). «Mortality in the Democratic Republic of Congo: a nationwide survey». Lancet 367 (9504): 44–51. DOI:10.1016/S0140-6736(06)67923-3. PMID 16399152. یوْخلانیلیب27 December 2011. اینگیلیسجه ویکی‌پدیاسی‌نین ایشلدنلری طرفیندن یارانمیش«Second Congo War»، مقاله‌سیندن گؤتورولوبدور. ( ۲۸ سپتامبر ۲۰۱۸ تاریخینده یوْخلانیلیبدیر). قارداش پروژه‌لرده ایکینجی کونقو ساواشی گؤره داها آرتیق بیلگی‌لر تاپابیلرسینیز.